This is a light, fresh all year cole slaw with almost no fat. Just a bit of good fats from olive oil and essential omega fatty acids from the walnuts. It’s great with ribs in the summer, it lightens up any holiday meal and goes with pretty much anything in between. I’m the kind of person who doesn’t mind spending a couple extra minutes segmenting the oranges. Then I squeeze the rest of the oranges over the salad to take advantage of all the juices. 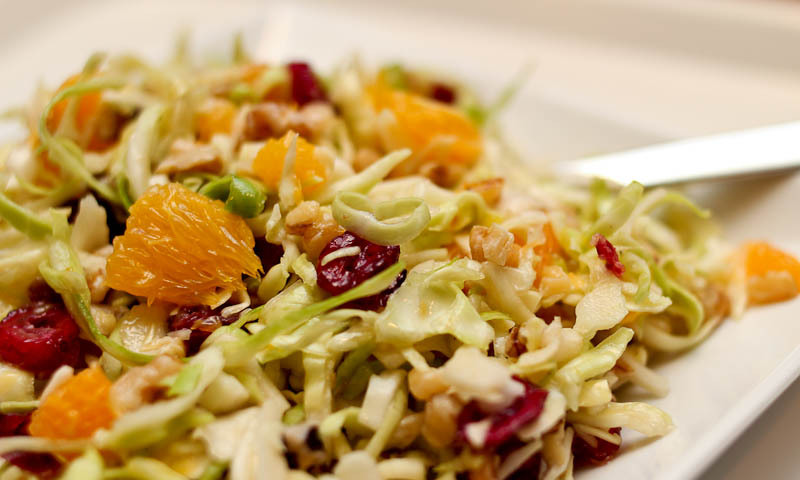 If you want to cut down the prep time, then simply cut the oranges into chunks and save 1/2 an orange to squeeze the juices over the cole slaw. Or you could open a can of mandarin segments and use a bit of the juices from the can. Drizzle lightly with olive oil and squeeze 1/2 orange over the cole slaw. Season with salt. That’s it. Substitute the cranberries with other dried fruits eg. golden raisins or dried cherries. Same with the walnuts, use your favorite nuts instead. You can’t really go wrong. This entry was posted in Salads & sides and tagged citrus slaw, cole slaw, healthy food blog, kålsalat, recipes, sides. Bookmark the permalink.